A space-hopping book of stunning science. Zoom to the stars with Oddblob the alien, and take part in a spacewalk that’s out of this world! Learn what the moon smells like! Discover which astronomers killed people! Find out why space makes your guts explode! Zoom around the planets, learn which galaxies eat each other, and see if you can spot a little green man while you’re there! With fantastic fact files, quirky quizzes and crazy cartoons, Space, Stars and Slimy Aliens will catapult you over the moon! soooo funny i love this book and all it’s series! 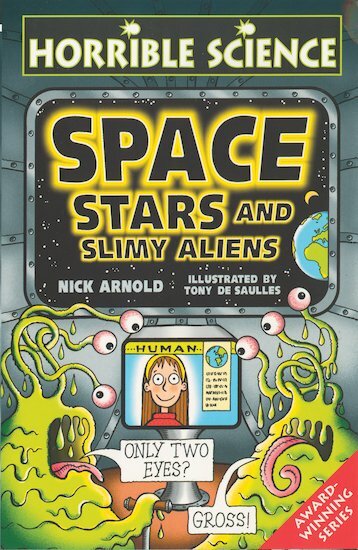 it’s a really fun way to learn about space and ‘aliens’. you don’t even have to like art, science or be good at either one of them to like this series. hope you like this book and i recommend all the other books in the series too!